The Plug Popper dislodges your plugs from their tray in a matter of seconds. No more broken stems or damaged roots. 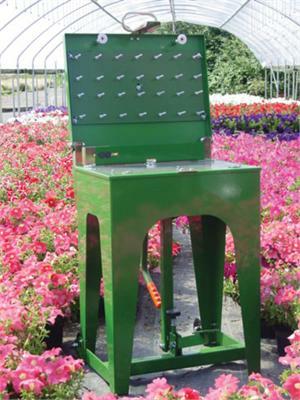 This indispensable horticultural tool works with a simple foot-pedal operation. Price includes your first insert, pins and the stand. Additional inserts sold seperately (#MSAPPDIC). You must supply us with the tray you will be using so that it can be matched up. All custom made. No cords, hoses or motors to maintain. The plug popper is easy to use and handles any tray with the swap of an insert. Try it for yourself! you will find that this heavy-duty workhorse pays for itself in a single season. Please click HERE to see more product details.